How can other people access the internet from my IP address? How do I get back to the search from a page with a captcha? I don't see a captcha. What should I do? Error 403. What should I do? Yandex search can be blocked if multiple simultaneous queries are received from a single IP address. In this situation, it is difficult to know if the search queries are automated or sent by real people. This might happen if several users access a Yandex service from devices connected to the internet from the same IP address. In such cases, Yandex interprets them all as one user and shows a captcha, which is a test for character recognition. Queries received from your IP address are not necessarily sent from your device. Internet service providers sometimes allocate the same IP address to several subscribers. If you are using a public network, such as a Wi-Fi network in a cafe, then you share the same IP address with all other people using the same Wi-Fi access point. It's also possible that your PC has been infected with a virus that sends automatic queries. We recommend that you run a virus scan using the Dr.Web CureIt! program or the Virus Removal Tool from Kaspersky Lab. To return to the search page, enter the characters shown in the captcha image and click Submit. To get a new captcha image, click . Instead of entering characters from an image, you can enter numbers from an audio captcha. To do this, click → Play and listen to the audio. Attention. Yandex only asks you to type characters from an image and never asks you to enter your phone number, send a text message, or retype your username and password. If you are asked to do so, then you have accessed a fake page. Please let us know via the feedback form. If you enter the characters correctly, Yandex will remember your browser as a trusted source for a long time (provided that cookies are enabled in your browser). If you need to send automatic queries to Yandex, consider using the Yandex.XML service. Make sure image loading is enabled in your browser. 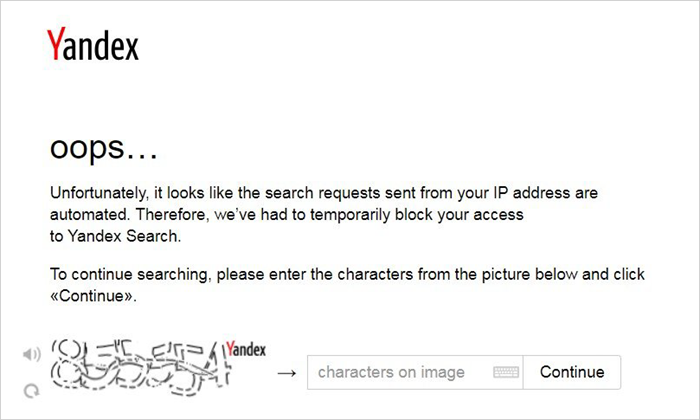 If you see the Yandex logo but cannot see an image with characters, make sure that image loading is not blocked by your browser's plug-ins or firewall settings. If you experience this issue at work, please contact your network administrator. Error 403 means that access to Yandex services is forbidden. This happens when an automatic program (bot) tries to bypass a captcha and sends too many simultaneous queries from dedicated IP addresses or via open proxies. Sometimes bots can use IP addresses belonging to real people. In this case, access to services is blocked, too. If you encounter this error, use the feedback form at the bottom of the page. A specialist will review your complaint and unblock the IP address earlier if the queries to the services were not automatic. Contact support for this service directly. To do this, go to the corresponding Help and use the feedback form there (the forms are usually located at the bottom of the pages or accessible from the table of contents). This way your message will get to the appropriate specialists right away and you will receive a response faster. If you need help with Yandex.Money, fill out the form on the Support service page. To report a problem with your site, go to the Feedback section of the Help for Yandex.Webmaster. How do I restore access to my Yandex account?